I’ve just found another video of the Lazarus sign, the spinal reflex that triggers an arm raising and crossing movement in recently brain dead patients. We’ve covered the mechanism behind the somewhat disconcerting movement before, and have noted an earlier video, but this one seems to have been uploaded quite recently. The movement is triggered by a reflex arc – a basic neural circuit that doesn’t go any further than the spinal cord which means that it can initiate movement even when the brain is non-functional. When the doctor taps your knee and causes a knee jerk, he or she is triggering exactly this effect. In fact, these movements can be triggered all over the body. If you’ve ever had a complete neurological examination the neurologist will tap on various points to trigger numerous reflex arcs to check that the nerves going to and from certain muscle groups are in good working order. One of these arcs causes the movement in the Lazarus sign, which, needless to say, can be quite disconcerting for doctors and quite confusing for relatives if the patient has just passed way. In fact, you can see from the video how ‘lifelike’ the movement seems. Probably not recommended if you’re uncomfortable with the sight of recently dead people moving. Link to video of Lazarus sign. The exhibit is a serious of columns, which you pass from right to left. The penultimate column is to illustrate the idea of ice, and you’re invited by a palm shape to put your palm to the column (which is indeed cold). The interesting thing is the final column, which is meant to illustrate gravity somehow (it was broken yesterday, so I don’t know how it is supposed to do this). Notice how the metal around the IVY of gravity is worn away. None of the other columns had this. 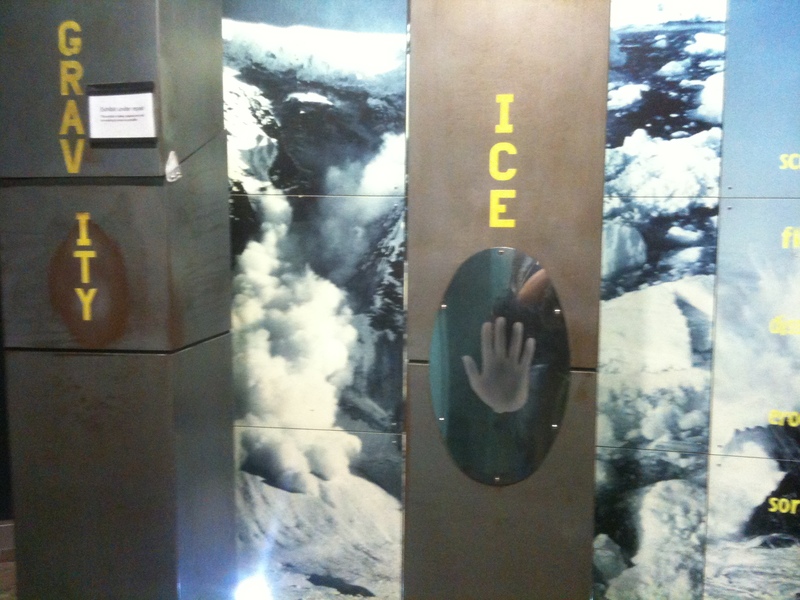 Obviously hundreds of visitors a day are drawn to this exhibit, press their palms to the ICE column and then go on to touch, in exactly the same way, the GRAVITY column even though this isn’t part of the way they are supposed to interact with the exhibit. Psychologists know that what people have done before is the best predictor of what they will do in the future. Whole industries are devoted to helping us establish, or break, habits. This exhibit on geological forces illustrates how easily some behavioural precedents can be set. We love touching things, and although we aren’t meant to, permission to do it once is all that is required to set off an immediate repetition of the behaviour. A brief yet intriguing description of a talk on pointing, by the ever versatile neuroscientist and philosopher Ray Tallis at the recent Hay Literary Festival. A spellbinding hour with philosopher and self-confessed “many-layered anorak” Raymond Tallis on the subject of pointing. Yes, sticking your finger in the air and directing it at an object. It is, he argued, one of the attributes that mark us out as human beings with a sense of ourselves and others in a shared space: no other animal, including pointers and chimps, can use pointing fully. He reflected on its use for babies as a staging post towards acquiring language; and noted that in autistic children there is often an absence of pointing. He talked about pointing and power: the pointing that marks some unfortunate from a crowd and summons them to who-knows-what; the Malcolm Tucker-esque jabbing of the air that is tantamount to “a one-fingered punching at the self”. Then there is the disembodied, absent, generalised pointing of the fingerpost, which has “the ghost of intention about it”.